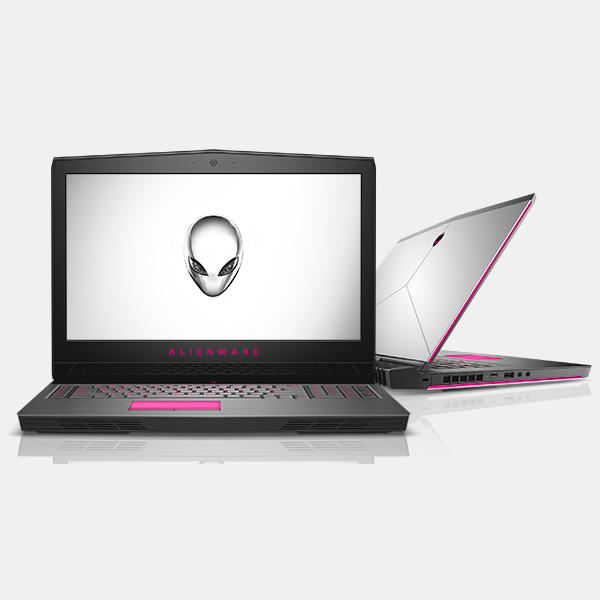 Meticulously designed to deliver a knockout performance: The Alienware 15 features up to 8th Gen Intel® Core™ i9-Series processors for our most powerful 15-inch laptop ever. This machine is mechanically engineered with improved Alienware Cryo-Tech V2.0 thermal technology, plus a thin, hinge-forward design to extract the maximum performance from top-of-the-line components. With the cooling system upgraded, and state-of-the-art ventilation, your system can stay cool even under extreme graphics pressure. Built with premium materials, this machine utilizes magnesium alloy for rigidity, copper for better performance, anodized aluminum for extra protection and steel for tactile comfort. And with support for up to NVIDIA® GTX 1080 Max-Q technology (110 watts) or AMD Radeon RX570 graphics, overclocked CPUs at 5.0GHz​, and high-speed DDR4 system memory capable of up to 2666MHz, you can experience gaming on a whole new level. A keyboard like no other: With an upgraded Alienware TactX keyboard, n-key rollover is now supported, enabling over 108-key commands for maximum actions per minute. It’s the only keyboard on a laptop with 2.2mm of key travel allowing for rapid response for any keystroke. A steel back plate offers rigidity and uniform feedback guaranteed to stay functional for up to 10 million keystrokes. Create a more personalized look for your machine with new and improved AlienFX. Designed with optimized RGB-LED enabled AlienFX lighting and now supported on over 145 games with the option to create and download unique themes. Designed for VR: Dive into mind-bending virtual reality experiences with a VR-ready system that passes the Oculus Ready and Vive Optimized certifications. You’ll experience the latest AAA game titles and VR content the way they were meant to be seen. Achieve a new level of presence powered by NVIDIA® VRWorks technology. Realistic visuals, sound, touch interactions and simulated environments are your new virtual reality. And with NVIDIA® GeForce® 10-series graphics and the latest, greatest CPUs, the Alienware 15 goes beyond what’s expected. Nothing between you and gaming: NVIDIA® G-Sync delivers the smoothest and fastest experience ever thanks to its ability to synchronize display refresh rates to the GPU in your GeForce® GTX-powered PC, eliminating screen tearing and minimizing both display stutter and input lag. Witness the difference an expansive 15" LCD screen can make with supported FHD 60Hz, FHD 120Hz and UHD resolution options – all with anti-glare finish. Meticulously designed to deliver a knockout performance: The Alienware 17 features up to 8th Gen Intel® Core™ i9-Series processors for the ultimate evolution in high-performance gaming technology. This machine is mechanically engineered with improved Alienware Cryo-Tech V2.0 thermal technology, plus a thin, hinge-forward design to extract the maximum performance from top-of-the-line components. With the cooling system upgraded, and state-of-the-art ventilation, your system can stay cool even under extreme graphics pressure.Built with premium materials, this machine utilizes magnesium alloy for rigidity, copper for better performance, anodized aluminum for extra protection and steel for tactile comfort. With support for up to NVIDIA® GTX 1080, with all NVIDIA® GPUs overclocked, you can experience gaming on a whole new level. Designed for VR: Dive into mind-bending virtual reality experiences with a VR-ready system that passes the Oculus Ready and Vive Optimized certifications. You’ll experience the latest AAA game titles and VR content the way they were meant to be seen. Achieve a new level of presence powered by NVIDIA® VRWorks technology. Realistic visuals, sound, touch interactions and simulated environments are your new virtual reality. And with NVIDIA® GeForce® 10-series graphics and the latest, greatest CPUs, the Alienware 17 goes beyond what’s expected. Nothing between you and gaming: NVIDIA® G-Sync technology, available on select modules, delivers the smoothest, fastest experience ever thanks to synchronized display refresh rates to the GPU in your GeForce® GTX-powered PC, eliminating screen tearing and minimizing display stutter and input lag. Witness the difference an expansive 17-inch LCD screen can make with supported FHD, QHD 120Hz and UHD resolution options – all with an anti-glare finish.